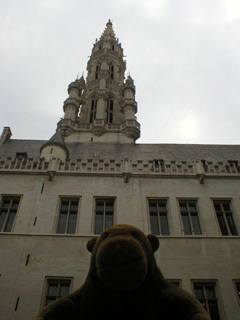 "I think I'm something of a specialist in the eating of bananas"
The Hotel de Ville, the town hall, was built in the mid fifteenth century and is too big to fit into pictures properly. 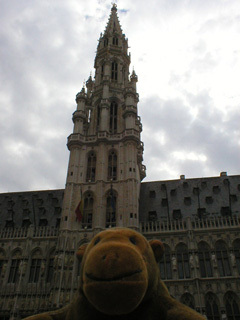 Mr Monkey was impressed by all the statues and gargoyles, but when he went into the courtyard inside he found that the decoration was only on the outside. The spire is 96 metres high, and is the work of Jan van Ruysbroeck, who was something of a specialist in the building of spires. 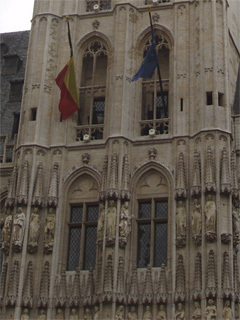 The French artillery used this spire as an aiming point when they were demolishing the rest of the Grote Markt in 1695.